Mobile use of Twitter has climbed by more than 60 percent since April, when the company introduced its official iPhone (s aapl) client, Twitter CEO Ev Williams said in a status update posted to the company’s blog. The Twitter founder also said that the microblogging service has 145 million registered users, up almost 40 percent from the number it had four months ago. We did iPhone user tests and confirmed that even though there was a plethora of third-party Twitter apps, people were having trouble finding and selecting one because none were called “Twitter.” This kept them from using Twitter at all. 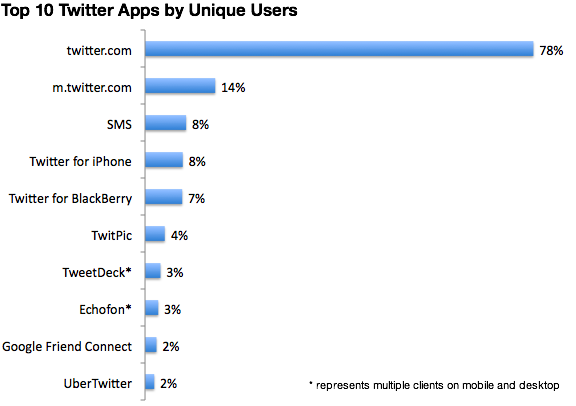 What’s interesting is that based on the statistics provided by the Twitter founder in his post, almost as many people use the Twitter mobile website as use the iPhone or the BlackBerry apps put together. New users of the service may prefer the website when they are just starting to get a feel for Twitter, then develop a need for dedicated apps once they become more frequent users. Twitter’s purchase of Tweetie was controversial at the time, because the company was seen by some as targeting third-party developers and applications, or “hole-fillers,” as they came to be called after a post by Union Square Ventures partner and Twitter backer Fred Wilson. Some of those tensions were smoothed over at the company’s Chirp conference for developers in April, where Twitter made a point of reaching out to the third-party app community. The company has also worked with app developers to implement the recent switchover to using OAuth as authentication for the service. Twitter recently launched a new app for the iPad — the first app that the company has built from the ground up — which Liz wrote about and James reviewed.